Ceci n’est pas une reverie: The Architecture of Stanley Tigerman Yale School of Architecture 180 York Street New Haven, CT Through November 4 The exhibition Ceci n’est pas une reverie (“This is not a dream”) celebrates the work of architect Stanley Tigerman. Curated by Yale School of Architecture Associate Professor Emmanuel Petit, this retrospective tells the story of Tigerman’s professional career, beginning with his years at Yale as an undergraduate and then a graduate student in architecture. 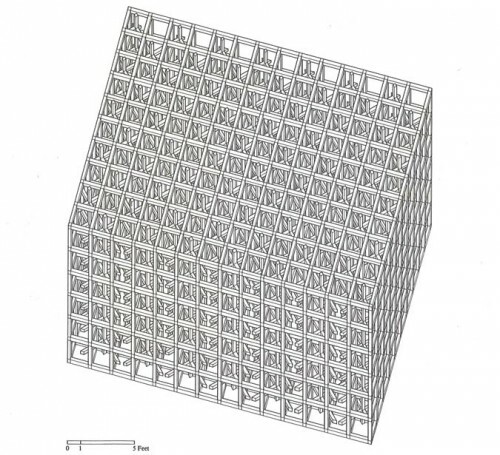 Organized around several motifs—utopia, allegory, death, humor, and division—the exhibition includes models and objects, documents, cartoons, sketches, and drawings, like an axonometric of formica, above. Video material from lectures and interviews also capture Tigerman’s eclectic style as it has evolved over the past 50 years, encompassing his early work at the Chicago-based firm Tigerman McCurry Architects and his return to Yale as a visiting professor. Ceci n’est pas une reverie will coincide with the publication of Tigerman’s collected writings, 1964-2011 Schlepping Through Ambivalence, Essays on an American Architectural Condition, and his autobiography Designing Bridges to Burn as well as a series of lectures at the Yale School of Architecture. Capping Santa Monica. Curbed LA got some great renderings from students at USC who where charged with imagining even more highway caps for the Pacific Coast Highway, this time from Arizona to California Avenues. 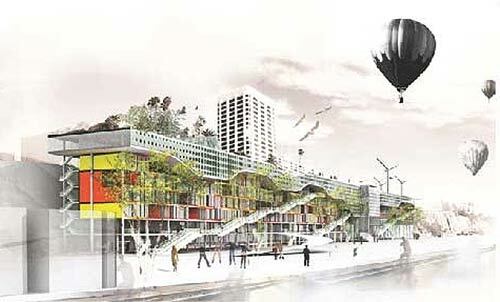 Beyond freeway parks, the students proposed housing, hotels, and community centers. Breaking Whitney. With the deal signed for the Met to take over the Whitney's Breuer building on Madison, directors at the ground breaking for the new branch at the High Line had all the more reason to celebrate. DNA reminds readers that the museum is actually retuning home. Ol' Gerty got the ball rolling on 8th Street way back in 1930. Dylan Sings. Happy B-day Bobby! Bob Dylan turned 70 on Tuesday and in celebration the Infrastructurist presents Dylan's Ten Best Infrastructure Songs, including "The Levee's Gonna Break" and "Marchin' to the City." Old School. Design New Haven has the Robert A.M. Stern drawings for "street calming measures" at Yale that are part of the $600 million for renovations, including two new residential colleges. The plan includes mixed use buildings intended to encourage street life at all hours and improved access to the Farmington Canal Greenway . Well, this is embarrassing: the MoMA and the Yale Center for British Art have nearly simultaneously come out with exhibitions on the same subject. In museum-world, isn't that like two girls showing up to a party in the same dress? Nevertheless, it’s an interesting enough topic that the repetition hardly matters. The Yale Center's "Art For All: British Posters For Transport," on view through August 15, and the MoMA's "Underground Gallery: London Transport Posters 1920s-1940s," on view through February 28, 2011, both offer a fascinating look at London’s innovative campaign to bring art into the Underground and create a strong civic identity. The two exhibits' slightly different focuses also help reduce the redundancy. The larger Yale exhibit features over 100 posters, really giving a sense of the diversity of artistic schools represented in the Underground campaign, ranging from Cubism, to post-impressionism, to Japanese woodblock prints. 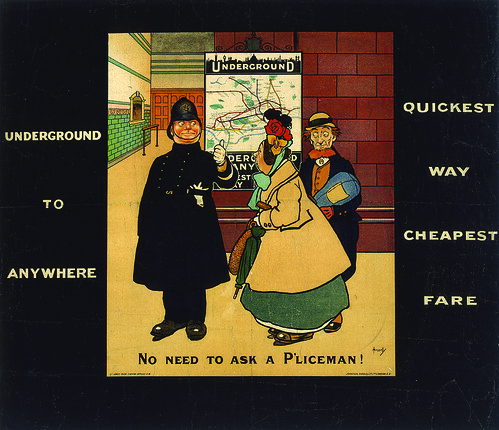 The MoMA show is a smaller installation, with only 20 posters, but the curators have chosen carefully to capture the zeitgeist of the city of London during those years -- its culture, its entertainment, and its fears of war. One could make a living chronicling the iniquities visited upon the work of Paul Rudolph (lord knows we certainly have). From modest tract homes to cutting edge office towers, the trail-blazing, highly influential architect's work has not fared well of late. Of the handful already demolished, as many are on the chopping block, and it has become an ongoing struggle for the Paul Rudolph Foundation to protect what's left. One of the better projects to come along was the expansion of Rudolph's Art & Architecture Building at Yale, where he taught for so long. But it now turns out that that was not the only renovation of the great architect's work going on in New Haven. ArchNewsNow pointed us to a story in yesterday's Yale Daily News about the Sigma Phi Epsilon fraternity's renovation to what was once Rudolph's own New Haven home. According to the YDN, the fraternity spent $25,000 bringing the house up to code, while eliminating--inadvertently or not--many of Rudolph's signature design features, such as his customary cantilevered stair case. Through the various owners, and up until recently, many elements like the floating stairs were retained. A clearer example of which can be seen in Rudolph's Halston Residence on 63rd Street for the famous Fashion magnate. Much like his 23 Beekman Place residence which would follow (and he would intervene into and out of for 30 years), this house was a work in progress and always up for alteration and innovation. That Rudolph primarily modified the buildings interior--there was a a rearyard addition--means that the latest renovations leave almost no traces of the original building, as the foundation notes. "The current look, all decked-out in Ikea, with "state-of-the-art" projection TV, as photographed by Calgary Leveen of the YDN is hardly recognizable as Rudolph's one-time home and can no longer be realistically considered as 'Rudolph space.'" And now we are obliged to make a snide remark about the thuggish clumsiness of the debauched Yalies who could not help but fall down the elegant stairs at parties, and thus defiled a modernist masterpiece. Except that Rudolph accolate, Yalie, and architecture school dean Robert A.M. Stern, in speaking with the YDN, does it for us.